Oxford SA Blog | Best-selling Oxford Afrikaans-English Bilingual School Dictionary now even bigger and better! Home Dictionaries Best-selling Oxford Afrikaans-English Bilingual School Dictionary now even bigger and better! 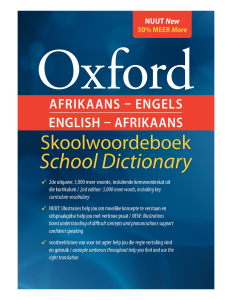 Exciting news for South African learners, parents and teachers is that Oxford University Press South Africa is poised to publish the eagerly awaited second edition of its hugely successful Afrikaans-Engels English-Afrikaans Skoolwoordeboek School Dictionary. In developing the first edition of this dictionary specifically for South African schools, the main goal was enabling learners to read, write, listen, and speak effectively and competently in their additional language. providing illustrations for difficult concepts or words, while at the same time building vocabulary through headword-related captions. The revised bilingual dictionary will be sporting another first: new headwords in this edition have been carefully selected from various corpora (collections of text), including OUP South Africa’s own, unique school textbook corpora made up of textbooks for a variety of subjects in English and Afrikaans. This dictionary will therefore not only support learners in unlocking general vocabulary, but also in understanding their textbooks better – enabling an all-round better academic performance in a school system where the majority of children are still taught in a language that is not their mother tongue. The material in the sizeable (48-page) study section not only provides a useful reference point for learners and teachers on grammar, writing and speaking, but also aims to help teachers develop learners’ dictionary skills, as required by the curriculum. These pages bristle with fun activities for honing dictionary skills, a mini-grammar, a step-by-step guide to editing and proofreading, formal and informal writing exemplars, helpful hints for confident speaking, and lots more!